If you’re anything like me, you’ve found yourself — at least once — encased in a vacuum desperately crying out for culture! We rarely use the word culture in its more traditional sense, but it’s worth bringing up today. As our larger society flounders amid strife, confusion and a lack of common vision, culture can be a heady term to recall. We can revive its aroma and redeploy its presence, creating greater happiness in our personal lives and in the world beyond. Think of culture as the beliefs, behaviors, customs, arts, etc., of a society, place, or even time. When employed at its best, culture is the atmosphere of collective thought that energizes people to improve themselves from within while creating progressively positive outcomes that benefit all. Ever consider the movies, TV shows, advertisements or even news reports we watch? Most of us grow familiar with presiding ideas and opinions and begin to consider them our own. It’s easy to fall into default mode. Assimilating into familiar atmospheres, we descend into social, intellectual and even emotional slumber. Rather than awakening to our own sense of what’s better, brighter or even happier, we surrender to prevailing ideas and behaviors. Few of us realize that the power to create and improve culture lies within us. With mindfulness and good intentions, we can help cure what exists in destructive or damaging cultures and serve as catalysts to spiral them back up again. Whether it’s in our family, school, office or community environment, we can insert new ideas, inspire creativity, contribute talents or merely exude a healing presence. Musing recently, I was brought back to earlier times when culture proved important for me and my well-being. At 17, I remember realizing how important it was for me to choose a college whose culture would help me grow into healthy adulthood. But I also recalled the flip side, the first time I needed to create a culture rather than absorb myself into an existing one. The photo above captures that story. I’m the 27-year-old Branch Manager smiling broadly in the center of six, equally smiling, colleagues. Joined by our seven significant others as guests, we were celebrating a week’s vacation aboard a Royal Caribbean cruise, courtesy of our Chicago-based corporate employer. Though guests of honor, others on the ship, including top executives, were unaware of our past. Less than two years earlier, we were orphaned sales reps at a newly installed Florida field office. With barely three months on the job, our manager received a promotion and left me behind to fill his very experienced shoes. Personal crises can wake us up, and this one did so for me. Tasked with navigating a future for our fledgling sales office, I needed to cultivate a winning culture — even though I couldn’t imagine one! Combining desperation and grit, I swallowed my fears and stepped into a leadership role that mostly everyone in the office wanted – except me. From a business perspective, we lacked brand awareness. Our company also carried the distinction of charging some of the highest prices in the marketplace. On the personal side, I faced peer pressure as fellow employees ignored me during sales meetings. A top producing rep told me she resented my getting the manager’s job and decided to quit. But saddled with a new mortgage at home and determined to forge forward in a quest that could benefit us all, I cultivated my own sense of culture. Over time, my leadership skills developed as I encouraged and promoted the talents and contributions of others. 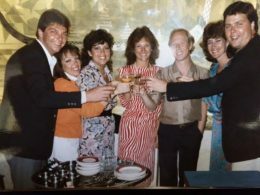 Accepting the Chairman’s Award in 1986, I was thrilled to have three sales reps, two major account managers, and a sales manager I’d promoted into my previous position with me from our office. Though several staff members remained behind, we knew our individual and collective success was felt and shared by all. I may have launched the culture, but others contributed to our winning dynamic. Together, we’d created excellence in a positive, fun-filled and supportive environment. Seeing ourselves as culture creators, we can all become living beacons to others. Through purposeful intentions, we can exercise our better selves to model, support and benefit the greater community. Specifically, we can give more of ourselves for the greater good, engaging dormant talents and infusing innovative solutions to what’s presently plaguing our popular psyche. Whether you awaken through personal crisis like me or merely perceive lack in a cultural vacuum, you can do your part to create a finer culture. As you become a culture creator, plan to discover greater purpose, satisfaction and a bit more joy in life, too! Listen here or click the bar below to hear Podcast 104: Are You Creating Culture? My Mothers’ Day Video entitled, The Song of Your Life. My video from the U.S. Naval Academy entitled, Rites of Passage. My blog and video with TV butler Charles MacPherson entitled, Nobility of Service.